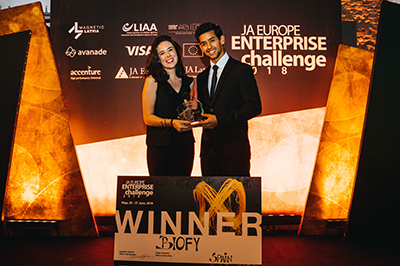 Out of some 15,000 university students enrolled this year in the JA Start Up Programme, BIOFY, a Spanish startup won the European Enterprise Challenge Award 2018 during JA Europe Enterprise Challenge after winning the national final of the JA Start Up Programme in Spain. JA Start Up programme’s European Enterprise Challenge final took place in Riga (Latvia) on June 25-27 with altogether 16 student start-up teams from 15 countries. The European Enterprise Challenge hosted this year by JA Latvia gathered 16 startups from 15 countries in Riga. University students who took part in the ‘Start Up Programme’ were competing and presenting their start-ups to a selected jury after a three-phases selection process: stage pitching, jury interviews, and stand exhibition. The main Award was presented to BIOFY a team from Malaga University in Spain. They impressed the jury with their innovative process which turns plastic waste into low sulphur fuel oil, a fuel already used in industry, agriculture, boats and even electricity generation. This method saves 2.5 tons of CO2eq for each ton of plastic treated at a more stable price as it is made on national territory. “Thank you JA and thank you very much to the rest of our team who could not be here today. We are very proud to recognised for our work. Our next step? We want to reach out to more people who share the same environmental concerns and support companies who have the same ambitions as we do. Together, we are stronger,” said Marcello Hornillos from BIOFY. Every year, the Startup programme engages over 14,000 students from 300 centres of higher learning, giving them the opportunity to experience running a business from top to bottom. Supporting European goals of improving youth employability and entrepreneurship, the programme fosters key competences to ensure that students are prepared for tomorrow’s jobs and challgenges. They gain key understanding in self-employment, business creation, risk-taking and coping with adversity, all with the support of experienced business volunteers. The jury, chaired by Hans Daems, Group Public Affairs Officer at Hitachi Europe, decided to reward BIOFY not only for its great idea but also for its clear business case and strong multi-talented team solving the problem and creating important partnerships with raw material providers and purchasers of the finished products. They also appreciated that BIOFY had already received recognition from governmental authorities to back up their business case. The European Enterprise Challenge is supported by businesses who also present their own signature Awards. At local level, the Accenture Meaningful Innovation Award recognised Bulletin.ai from Finland while at European level, the Avanade Digital Innovation Award was presented to the CookmeUp from France who developed a French concept of restaurant following the guideline « 1 Product, 3 Cookings, 1000 Flavors ». The Visa Award for Digital Commerce Everywhere rewarded Kale Nyabo from Denmark who is selling handcraft from Uganada single mothers around the world. “The future of work will be powered by digital. Europe must invest in more in entrepreneurship education so that more young people learn to make the most of their digital know-how. Avanade and VISA are setting a fine example of how that can be done in a most impactful and compelling way. Their efforts are switching on the entrepreneurial potential of thousands of young people.” said Caroline Jenner, CEO, JA Europe. Recognizing the young entrepreneurs who were best able to put their digital skills into practice to conceive an innovative business idea or concept. In addition to having an excellent business plan the start-ups will be judged on their ability to demonstrate the most creative use of digital innovations such as, mobility, collaboration tools, cloud-based technology, machine learning, artificial intelligent, Internet of Things and blockchain, in their products or services. Award Prize: €1,000 and the opportunity to meet and engage with Avanade Senior executives over breakfast, and in a roundtable at the Avanade London Headquarters. Digital technologies have enabled individuals to connect to the global network, and with the growth of mobile devices we are only a tap away from streaming the latest content or ordering products from the other side of the world. At Visa we see this more than ever, as digital payments continue to drive innovation around the world. Award Prize: €1,000 and a one-day session in Visa’s Innovation Centre in London in the fall 2019. How do you improve the way people live and work? We ask ourselves this question every day - to innovate not just for innovation’s sake, but to add real value to people’s lives. Accenture is helping the world’s biggest companies solve their most complex challenges. Award Prize: €1,000 and mentoring & coaching from Accenture executive + invitations to a selection of Accenture activities and events.